@benzo – no I did not know about this, but which road is going to be a two-way bike way? Carson or Birmingham Bridge? I wish I had taken a photo, but to give a better description: the bike lane markings I saw were on Carson (inbound or river side), with a bicycle lane sharrow-type logo on either side of the intersection with the Birmingham Bridge. If riders on Carson were following the markings, one would be “salmoning” and they would both collide head on in the middle of the intersection near the end of the median on Birmingham Bridge. Hope this helps explain it a bit better. Yeah, the bridge is going to be two-way bikeway during construction. I did just see the new marking yesterday at the end of the bridge on carson. It was a little confusing at first. I’m not sure what exactly that’s all about. Looks like they were trying to repurpose the area with the hash bars in to a sort of bike lane through the intersection. Seems a bit odd, I’m willing to see how it develops as they keep making changes to traffic patterns here. Sidewalk on west side of browns hill road turns in to a drainage ditch before reaching homestead grays bridge. This is not friendly for pedestrians, wheelchair users, or cyclists. Location is on browns hill road between parkview blvd and steelview ave steps. 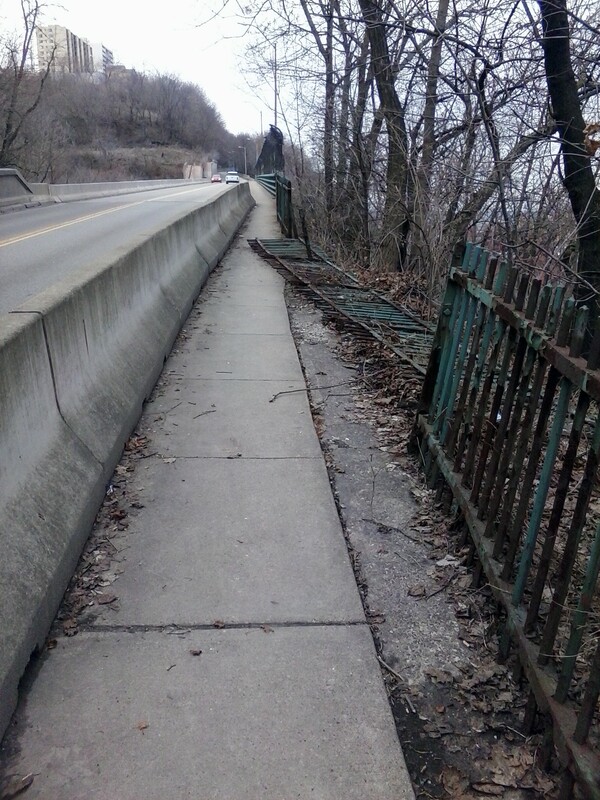 Three Rivers Heritage Trail along the Ohio River in Cateau Neighborhood on the North Side between N. Franklin St and Branchport St needs repairs. The asphalt near the river is warped and uneven. It looks like erosion may be wearing away at the subsurface. It can be hazardous. Additionally, excess amounts of leaves have collected on the edges of the trails, especially on the damaged bits of asphalt and needs to be removed. These are hazardous when wet and are extremely slippery. Traffic lights on Morewood Ave at 5th Ave need a left turn cycle. During rush hour it can be impossible to make a left turn from Morewood Ave on to 5th Ave from either direction without running a red light. On tuesday evening rush hour, I witnessed 4 cars (two in each direction) run red lights to make a left on to 5th ave after the light cycle ended so they could make a left turn. They had been waiting the entire light cycle and found no gaps to turn. This was illegal, but the illegal behavior was encouraged by poor traffic signal design. Don’t cars trying to make a left just pull into the intersection and stop, then wait for the light to change to red before completing their turn? Doing that isn’t considered running a red light, as I understand it. There might be a reason to add a left turn cycle, if there are so many cars trying to turn left that the above arrangement, with potentially just one car turning per light cycle, causes backups. Is that the case, or are drivers there just unwilling to wait their turn in line? It is legal to make a left if you are in the intersection when teh light turns read. I’m guessing “in the intersection” means “Part of your car is past the broad white line where you are supposed to stop”. So that usually means two or three cars. On Morewood, that is some group of cars in each direction- an accident waiting to happen. So if it’s legal as long as you’ve stopped in the intersection, then you’d have to actually be past Fifth’s curb, not just past the white stop line. Of course, drivers do that anyway if they think they can get away with it. I believe that blocking intersection like this became illegal in PA two-three years ago. Once I was receiving updates on the driving code (this e-mail account is not active anymore) and vaguely remember reading about it. Section 3353 says “no person shall … Stop, stand or park a vehicle … Within an intersection”, but also says “Except when necessary to avoid conflict with other traffic”. I didn’t see anything else that might prohibit this, so as far as I can tell, it’s still legal. Yeah, this is the problem. People have to make an illegal maneuver to ever have a chance at turning left in either direction during busy traffic. This is why we still have the pittsburgh left. It’s an easy technical solution to fix the traffic flow at this intersection, but not a free one. @Pgh311 Glass in street, 3300 block of Perrysville Av, southbound. Pls send street sweeper. @bus15237 Request ID# 152059 submitted to DPW to address glass/debris in 3000 blk of Perrysville Ave. Thank you! Since S. Millvale ave between baum blvd and liberty ave not included on the paving list. Put in 311 ticket to evaluate for repaving. It is a potholed mess. Much to my surprise, cars are already parked in the 6th Street Bike Lanes. So I 311’d it, and was ensured that it would be taken care of. I have submitted a few. I went down to Sixth Street on my lunch break yesterday and a bike cop was there herding people out of the lane. It is going to take some time I imagine. But someone is responding to 311’s. Storm Drain Grate on S. Millvale ave bridge on southern / eastern end, near the intersection of S. MIllvale Ave and Morewood Ave, is damaged and missing two rods. Holes large enough to step in to and get caught. This is right before the bike lane and could cause accidents. …and further noting that that second tweet has one “favorite”, which is PWSA acknowledging that they saw it. 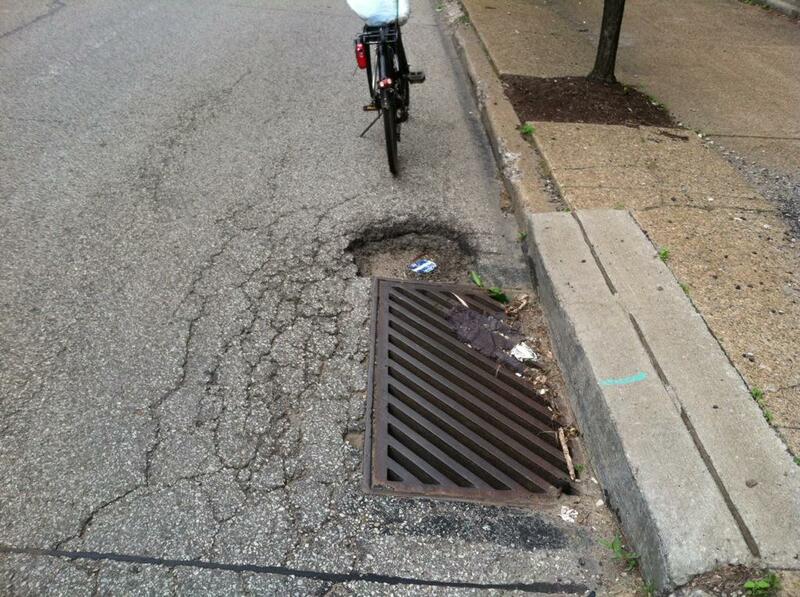 Be careful around this repair site on S. Millvale ave bike lane, looks unfinished. You could sink in to the super soft material here. It compressed to the touch by hand. Several bike tracks in the black tar/aggregate around the new grate. Tree down on EFT/Jail Trail between Birmingham Bridge and Second Ave. parking lot. 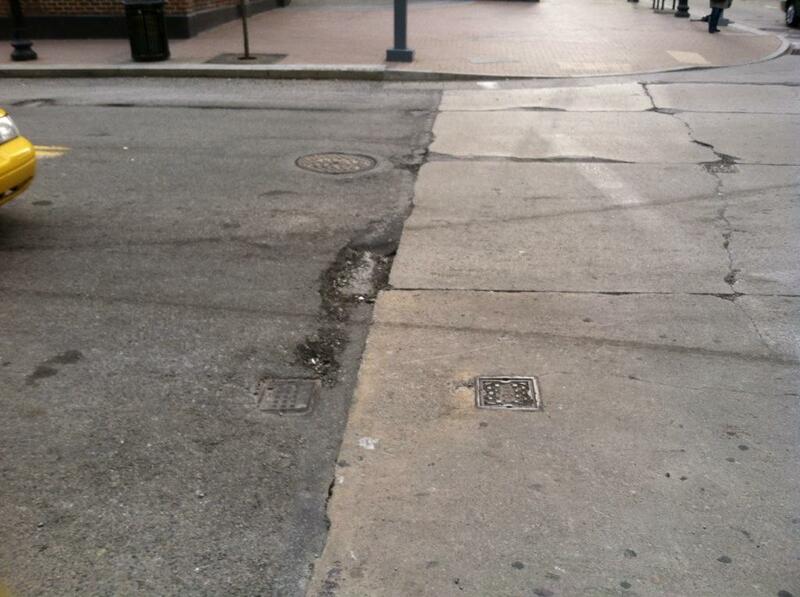 @bus15237 Request ID# 11259 submitted to DPW to address pothole @ 4000 5th Ave (University of Pittsburgh Store) Thank you! @bus15237 This area is not currently on the resurfacing list, but will be evaluated for future paving. Thank you! In the past several years, the concrete bike/ped ramp to Fort Pitt Bridge sidewalk has crumbled, in Point State Park (near Fort Pitt Museum). There are several potholes the width of the ramp. When Yale reported the problem to city of Pittsburgh’s 311, they told him to contact PennDOT. He and I contacted PennDOT, and they forwarded the complaint to the City of Pittsburgh. 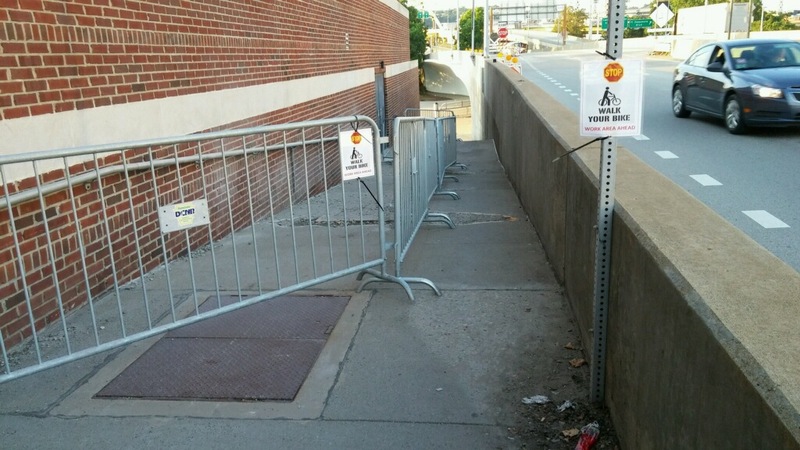 Is this pure “pass the buck”, or do the City of Pittsburgh and PennDOT genuinely disagree on who is responsible for sidewalks like this? I have knocked a few fillings loose coming down that bridge. Someone has obviously looked at it and spray painted around the holes. But it does appear that the, “pass the buck” you mentioned is true. 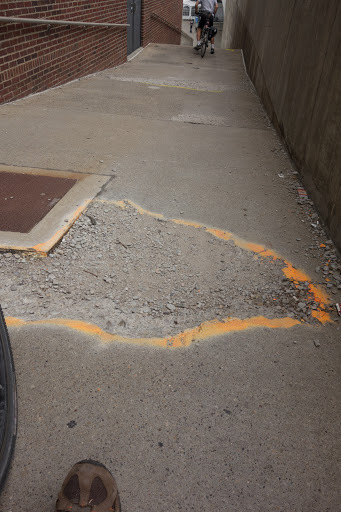 Same thing I ran into on the McKees Rocks bridge, penndot says they are responsible for the road surface and the local municipality is responsible for the sidewalk. The problem is the municipalities don’t seem to agree and so nothing gets done. Not sure who can arbitrate. Re the Ft Pitt Bridge ramps–has anyone contacted Point State Park management, or DCNR generally? If anyone wants to do more research, this PDF has some good citations backing up Buffalo Buffalo’s point, though some of it is specific to Philadelphia. @buffalobuffalo: Good idea. I just wrote an email to the manager at Point State Park about that sidewalk/ramp. I don’t know if they (or City of Pittsburgh or PennDOT, or other entity) is responsible for this, but if we squawk loud and long enough, we should be able to get this fixed. Pothole, Liberty Ave, Inbound, approaching 32nd St., in the Sharrow Track. Just witnessed an accident there resulting from a cyclist hitting the pothole. Phoned 311 and was told report would be sent to Public Works. pole on the curb line just a few feet down-road from the pothole. Flat handlebar now swept back on right side. 1. Gravel/debris collecting in single available inbound lane through construction zone on West Carson Street. A nightmare to ride on a bike or motorcycle in its current state. I requested that it be cleared/swept free of debris. 2. California Avenue in the weird “dual one way” section just north of Marshall Avenue – the concrete at the pavement joints is wearing away, leaving big potholes. Yale shot this picture. He talked to a worker there yesterday and was told that the Department of Conservation and Natural Resources (DCNR) is now working on the sidewalk of the Fort Pitt Bridge near Fort Pitt Museum. It’s good that they’re giving some attention to that sidewalk from the bridge down to point state park. But ironically, their safety measure is more dangerous than if they had done nothing. About time that they fixed that. I always thought it was nuts that that walkway had potholes.